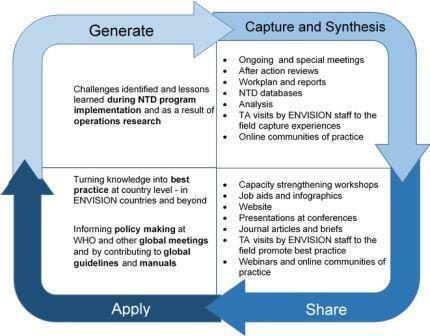 ENVISION has a unique role in the global NTD community as it is the largest operational NTD platform globally. In addition to its responsibility to affect NTD programs meeting the established WHO guidelines, it also has the opportunity to recognize and highlight programmatic challenges; identify and disseminate best practices; engage in operational research, share programmatic knowledge with the broader NTD community; work with global partners to formulate new, more effective strategies; and finally help countries implement programmatic improvements. See the key cycling of this systematic, knowledge management approach to programmatic challenges. ENVISION staff work closely with USAID to provide technical leadership to WHO, the donor community, and the MOHs by actively participating in global and national forums as well as through developing specific program tools and strategic approaches.